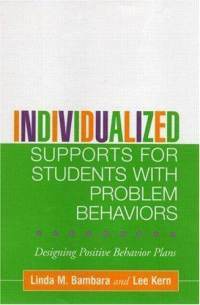 Individualized Supports for Students with Problem Behaviors by Linda M. Bambara and Lee Kern. This book focuses on the nuts and bolts of designing positive behavior support plans for students with such disabilities as mental retardation, autism, learning disabilities, and emotional/behavioral disorders. Strategies are provided for addressing individual behavioral problems at all levels of severity. Pp. 400.